Caramelized Brussels sprouts in a maple glaze spiked with a hint of Aleppo peppers. Aleppo-Maple Glazed Brussels Sprouts made in the Adventure Kitchen. Brussels sprouts trimmed, rinsed and ready for action in the Adventure Kitchen. 1. Peel away any loose or yellowed outer leaves from the Brussels sprouts and trim the stems near the base of each sprout. Rinse them if needed and dry them on paper towels. Cut each sprout in half vertically down through the stem (the tiniest sprouts don't need to be cut). 2. Heat the butter and olive oil together in a large skillet over medium-high heat. Add the Brussels sprouts in one layer, preferably cut-side down, to brown in the hot oil for about 1-2 minutes. 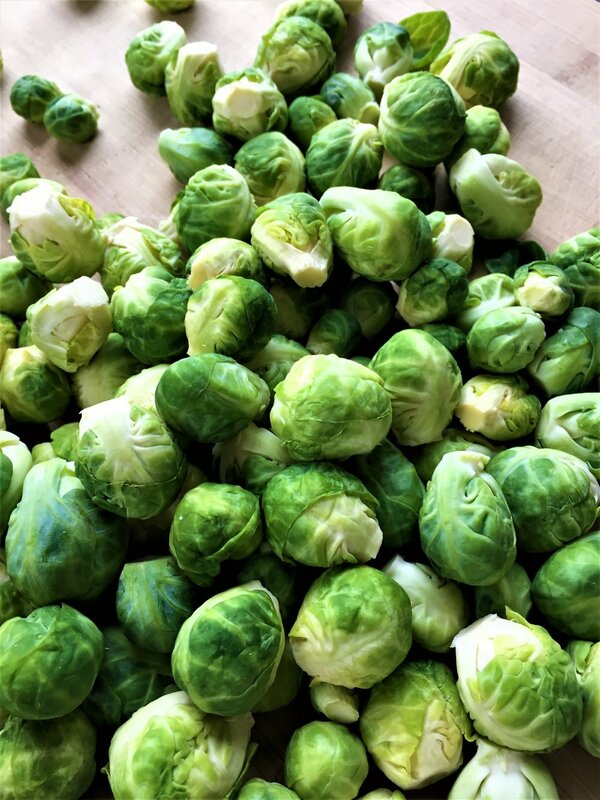 You may need to work in batches to allow all the sprouts to brown (and if so, you may need to add more butter and olive oil to the pan before the second batch). Season the sprouts with the salt, pepper and Aleppo pepper, and turn them to allow them to brown on the other side for another 1-2 minutes. 4. Remove the lid and gently stir the sprouts around to be sure they are evenly coated with the liquid. Turn the heat to high for 1-2 minutes to allow the liquid to reduce to a glaze, as you shake the pan occasionally. 5. Taste and add another pinch of salt if needed. Serve with the glazed sauce. Aleppo pepper is a really unique and wonderful spice from Syria that is now being grown in neighboring Turkey. It's slightly sweet, slightly spicy, with just the barest hint of smoke. Get it at the Adventure Kitchen store! A reasonably close substitute might be a very small pinch of crushed red pepper and a very small pinch of smoked paprika. Or just use the crushed red pepper, knowing you'll be missing the slight smokiness of the original concept (but still making a very delicious dish, I'm sure).